Information about total mercury and methylmercury concentrations in water samples and mercury concentrations in fish-tissue samples was summarized for 26 watersheds in Indiana that drain most of the land area of the State. Mercury levels were interpreted with information on streamflow, atmospheric mercury deposition, mercury emissions to the atmosphere, mercury in wastewater, and landscape characteristics. Unfiltered total mercury concentrations in 411 water samples from streams in the 26 watersheds had a median of 2.32 nanograms per liter (ng/L) and a maximum of 28.2 ng/L. When these concentrations were compared to Indiana water-quality criteria for mercury, 5.4 percent exceeded the 12-ng/L chronic-aquatic criterion, 59 percent exceeded the 1.8-ng/L Great Lakes human-health criterion, and 72.5 percent exceeded the 1.3-ng/L Great Lakes wildlife criterion. Mercury concentrations in water were related to streamflow, and the highest mercury concentrations were associated with the highest streamflows. On average, 67 percent of total mercury in streams was in a particulate form, and particulate mercury concentrations were significantly lower downstream from dams than at monitoring stations not affected by dams. Methylmercury is the organic fraction of total mercury and is the form of mercury that accumulates and magnifies in food chains. It is made from inorganic mercury by natural processes under specific conditions. Unfiltered methylmercury concentrations in 411 water samples had a median of 0.10 ng/L and a maximum of 0.66 ng/L. Methylmercury was a median 3.7 percent and maximum 64.8 percent of the total mercury in 252 samples for which methylmercury was reported. The percentages of methylmercury in water samples were significantly higher downstream from dams than at other monitoring stations. Nearly all of the total mercury detected in fish tissue was assumed to be methylmercury. Fish-tissue samples from the 26 watersheds had wet-weight mercury concentrations that exceeded the 0.3 milligram per kilogram (mg/kg) U.S. Environmental Protection Agency (USEPA) methylmercury criterion in 12.4 percent of the 1,731 samples. The median wet-weight concentration in the fish-tissue samples was 0.13 mg/kg, and the maximum was 1.07 mg/kg. A coarse-scale analysis of all fish-tissue data in each watershed and a fine-scale analysis of data within 5 kilometers (km) of the downstream end of each watershed showed similar results overall. Mercury concentrations in fish-tissue samples were highest in the White River watershed in southern Indiana and the Fall Creek watershed in central Indiana. In fish-tissue samples within 5 km of the downstream end of a watershed, the USEPA methylmercury criterion was exceeded by 45 percent of mercury concentrations from the White River watershed and 40 percent of the mercury concentration from the Fall Creek watershed. A clear relation between mercury concentrations in fish-tissue samples and methylmercury concentrations in water was not observed in the data from watersheds in Indiana. 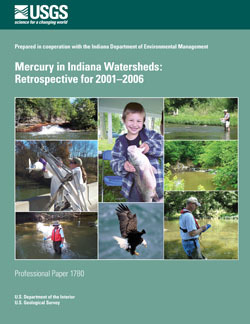 Average annual atmospheric mercury wet-deposition rates were mapped with data at 156 locations in Indiana and four surrounding states for 2001–2006. These maps revealed an area in southeastern Indiana with high mercury wet-deposition rates—from 15 to 19 micrograms per square meter per year (µg/m2/yr). Annual atmospheric mercury dry-deposition rates were estimated with an inferential method by using concentrations of mercury species in air samples at three locations in Indiana. Mercury dry deposition-rates were 5.6 to 13.6 µg/m2/yr and were 0.49 to 1.4 times mercury wet-deposition rates. Total mercury concentrations were detected in 96 percent of 402 samples of wastewater effluent from 50 publicly owned treatment works in the watersheds; the median concentration was 3.0 ng/L, and the maximum was 88 ng/L. When these concentrations were compared to Indiana water-quality criteria for mercury, 12 percent exceeded the 12-ng/L chronic-aquatic criterion, 68 percent exceeded the 1.8-ng/L Great Lakes human-health criterion, and 81 percent exceeded the 1.3-ng/L Great Lakes wildlife criterion. Annual stream mercury yields were calculated with a model by using the mercury concentrations in water samples and daily average streamflows for 2002–2006, normalized to the watershed drainage areas. The average annual total mercury stream yields ranged from 0.73 to 45.2 µg/m2/yr and were highest in two White River watersheds in central Indiana. Median methylmercury stream yield was 1.9 percent of the median total mercury stream yield. In most watersheds, average annual stream yields of total mercury were a fraction of the combined average annual atmospheric mercury wet-deposition and estimated annual dry-deposition loading rates, indicating that much of the stream mercury was attributable to atmospheric deposition. In two watersheds, average annual stream yields of total mercury were approximately twice the atmospheric mercury loading, indicating that some of the stream mercury apparently was not attributable to atmospheric deposition. Rather, some of the stream mercury yield potentially was contributed by mercury in wastewater discharges. Land-cover type corresponded with the mercury levels in three watersheds: (1) A watershed of the White River in central Indiana with a high percentage of urban land cover had some of the highest total mercury concentrations and stream mercury yields. The urban land cover and numerous permitted wastewater outfalls with mercury in treated effluent potentially contributed mercury to this watershed. (2) A monitoring station on the Maumee River in northeastern Indiana, downstream from a large area of urban land cover, recorded the highest stream mercury concentrations. The urban land cover and mercury detected in treated effluent potentially contributed to the high mercury concentrations at this station. (3) A watershed of the Patoka River in southern Indiana with a high percentage of forest land cover had the highest atmospheric mercury dry-deposition rate. The high dry-deposition rate from the forest land cover potentially contributed to the high mercury concentrations in this watershed. From a retrospective view, mercury concentrations in Indiana watersheds routinely exceeded criteria protective of humans and commonly exceeded criteria protective of wildlife. Atmospheric mercury wet deposition was a predominant factor, but not the single factor, affecting mercury in Indiana watersheds. Mercury in wastewater discharges and atmospheric mercury dry deposition apparently contributed a substantial part of the mercury yield from some watersheds. Dams and impoundments increased the percentage of methylmercury in downstream waters. Long-term monitoring of mercury in wet and dry atmospheric deposition, and in streams and reservoirs, coordinated with monitoring of mercury in fish, will be needed to detect whether mercury levels in Indiana watersheds change in the future. Risch, M.R., Baker, N.T., Fowler, K.K., Egler, A.L., and Lampe, D.C., 2010, Mercury in Indiana watersheds: Retrospective for 2001–2006: U.S. Geological Survey Professional Paper 1780, 66 p. plus appendixes.